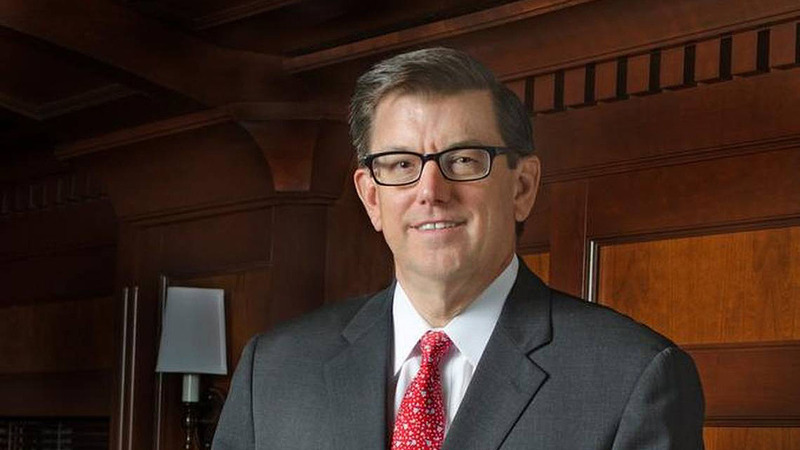 KCS President and CEO Patrick Ottensmeyer. KCS reported record 4Q2018 revenues of $694 million, an increase of 5% from 4Q2017, while carload volumes remained flat compared to the prior year. Reported operating expenses in 4Q2018 were $438 million. Excluding a gain on insurance recoveries related to damage and service interruptions from Hurricane Harvey in 2017, adjusted operating expenses were $446 million, 6% higher than 2017. Adjusted operating income was $248 million, 4% higher than a year ago. KCS reported an adjusted fourth-quarter operating ratio of 64.3%, 30 basis points higher than prior year. Reported net income in 4Q2018 was $162 million, or $1.59 per diluted share. Adjusted diluted earnings per share was a fourth-quarter record of $1.56, 13% higher than a year ago. For full-year of 2018, KCS achieved record revenues, adjusted operating income and adjusted diluted earnings per share. Revenue was $2.7 billion, up 5% from 2017, on 2% carload growth. Full-year 2018 operating income was $986 million. Excluding a gain on insurance recoveries, adjusted operating income was $968 million, a 5% increase over prior year. The company’s 2018 adjusted operating ratio was 64.3%, unchanged from 2017. 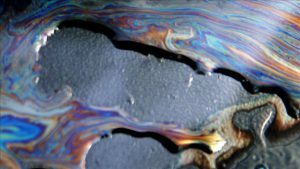 Reported net income in 2018 was $629 million, or $6.13 per diluted share. Adjusted diluted earnings per share was a record $5.97, 14% higher than a year ago. 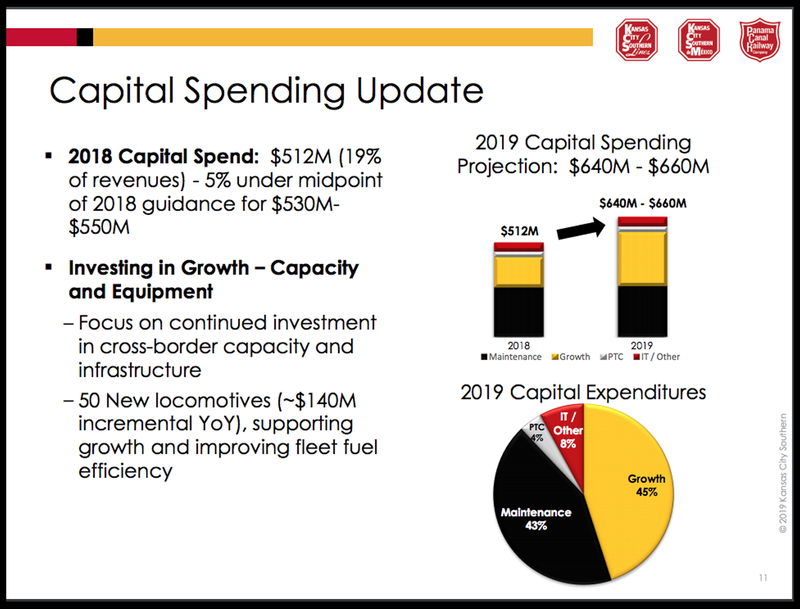 KCS plans to increase capital spending to between $640 million and $660 million this year, up substantially from the $530 million in capital expenditures in 2018. Those capex numbers include $140 million for the purchase of 50 new locomotives, while spending on maintenance-of-way and other engineering projects will stay “pretty much steady state,” according to Assistant Vice President Engineering Field Operations Mark Wille, addressing the NRC Conference on Marco Island earlier this month. KCS said it planned to reduce capex in 2020 and 2021. On the positive side, the railroad is planning a 42% increase in the number of ties it replaces and will contract out a few other big-ticket projects. 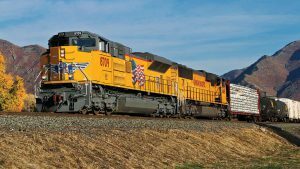 But in disappointing news for contractors and vendors, KCS will add just 25 miles of rail this year—a dramatic decrease from the 55 miles it added in 2018. 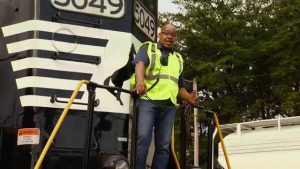 In addition, the railroad said some 8 miles of rail will be added to the Meridian Speedway LLC (MSLLC), a joint venture between KCS and Norfolk Southern. That’s a modest increase from the 6 miles added last year. Wille told NRC attendees that KCS would replace 460,000 ties this year, up from the 323,000 of last year. 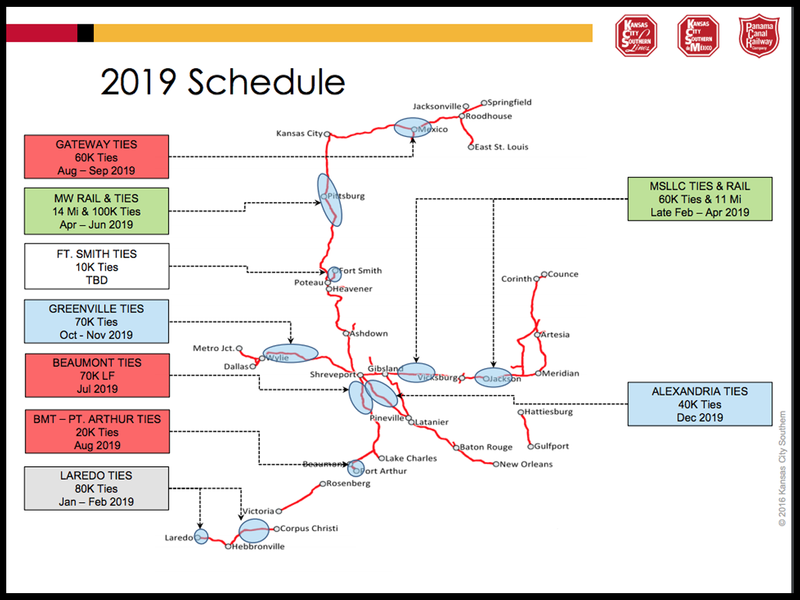 Although much of the tie work would will be done by KCS employees, there is some work coming for contractors and third-parties. Notably, speaking of 4,500 ties on the Delisle Branch. Wille said, “we’re probably going to contract that out.” In addition, system curve work should continue at about 20 miles a year, and the railroad “typically contracts that out,” he said. Among some of the larger projects expected in 2019 are 10,000-foot siding expansions at Spear and Weatherford, and an expansion of the Corpus Yard. On the technology front, KCS plans to develop “Dynamic Track Charts” and a tie/rail/ballast database. All of that work is “coming up for bid,” Wille said. 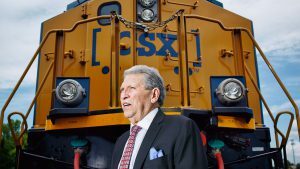 One interesting announcement in KCS’s earnings call was that that the railroad has hired Sameh Fahmy, who retired as Senior Vice President Engineering, Mechanical and Supply Management at CN in 2013, as a consultant on PSR. Railway Age Engineering Editor and RT&S Editor-in-Chief Paul Conley contributed the capex portion of this story.